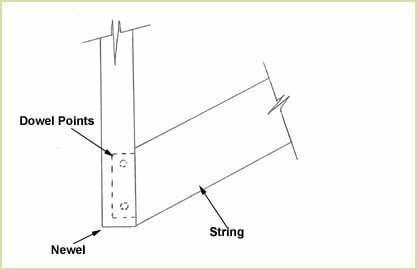 Basic Procedure To Fit Your Staircase. a) Check well size is as per plan. b) Finished floor to finished floor dimension. c) Overall width of the staircase. 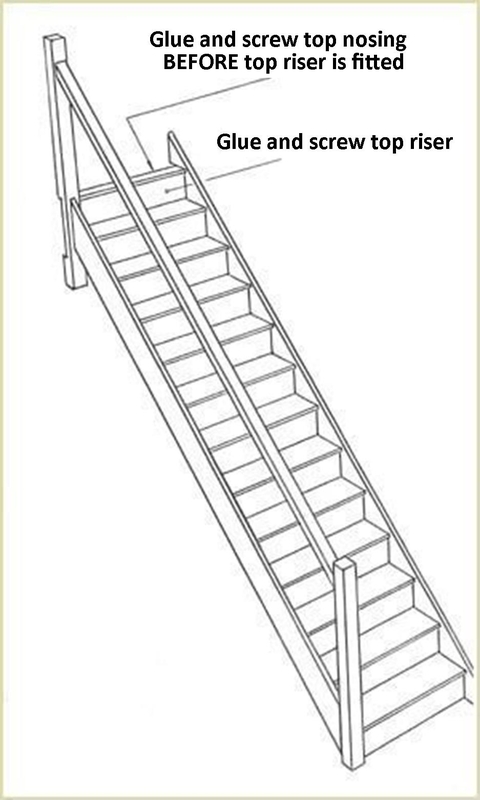 Always fit your staircase from top to bottom. Cut the top newel to fit onto trimmer. Firstly cut out top newel to fit onto trimmer. 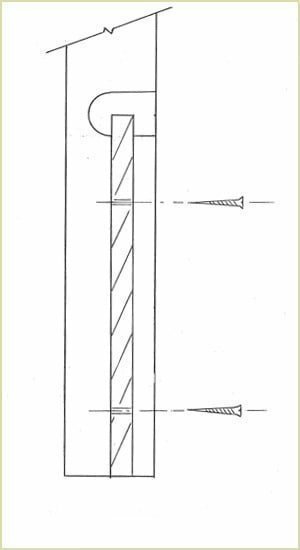 Do not fix newel at this stage. Put riser temporarily into position. 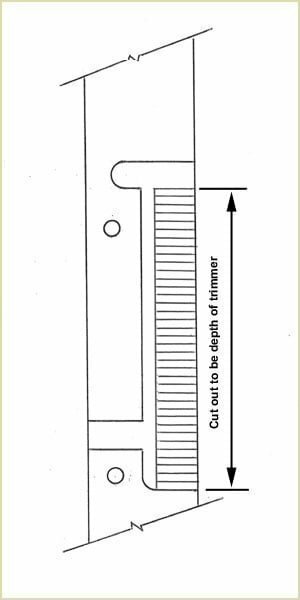 Scribe line the thickness of riser to determine the depth of the sawcut. 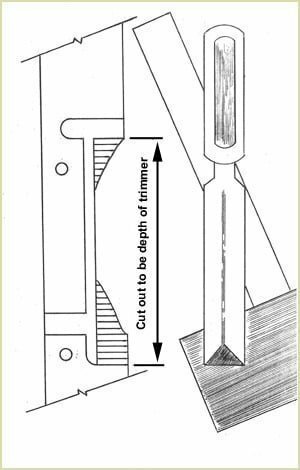 After marking your line, allowing for the thickness of riser, make saw cuts with a cross cut saw for easy removal with mallet and chisel. 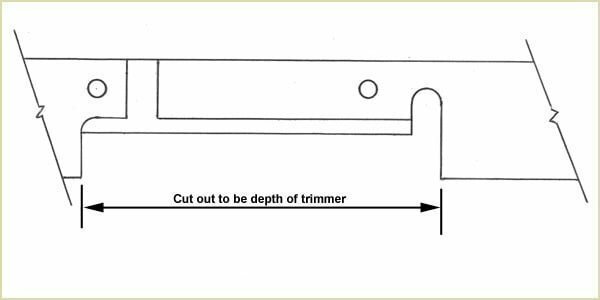 Using a mallet and a chisel, remove slithers of cut wood to leave a recess to fit onto trimmer. 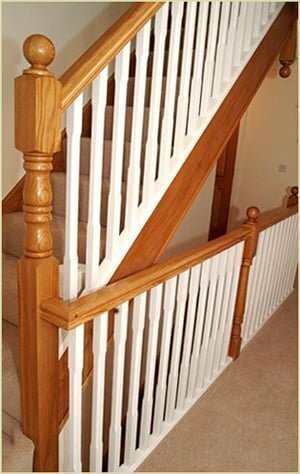 Your top newel should now look like this. 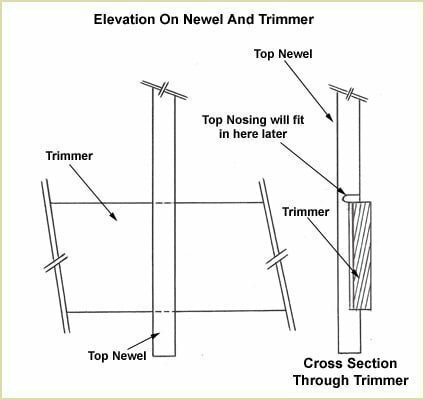 Cut the bottom newel to the correct length. Cut bottom newel to correct length. 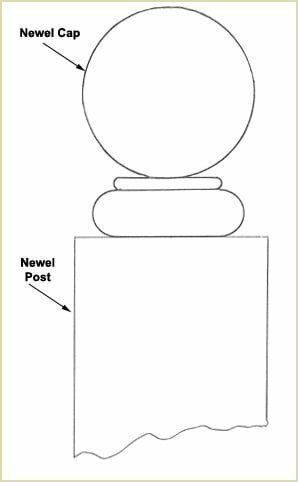 If the floor is not level it is possible that the newel may differ in length. Newels are always delivered extra long to allow for this. Fit and glue bottom newel onto the string. The dowel holes are drilled slightly off centre to pull the newel and string tightly together. Taper the dowel slightly for easy insertion. Once the piece is pulled up tight, cut off the excess dowel and back. With the bottom newel fitted slot the riser into position and mark bottom riser in line with bottom of newels. 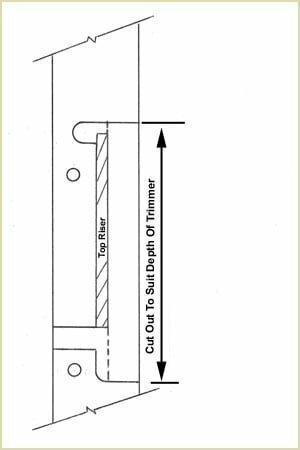 Take riser out and cut to correct length. You can now fit the riser into position by screwing into the riser and then the newel, also use glue. 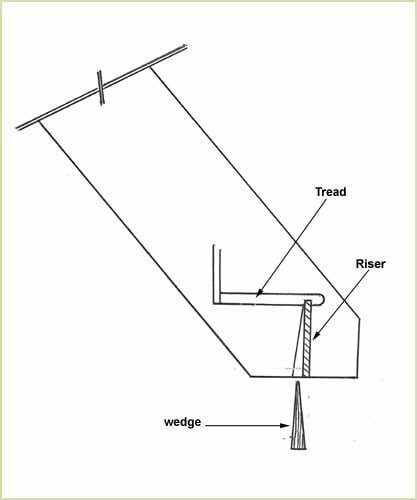 On the string side, the riser needs to be kept in place with a wedge as shown below. Please ensure that plenty of glue is applied to both edges and inside face of the wedge. Tap wedge firmly into place. Remove excess glue with a chisel. View looking underneath the staircase, showing glue blocks. The majority of these blocks will already be glued on your staircase. Once the bottom rise is fitted the blocks will need to be fitted. We recommend about 3 or 4 blocks per tread. 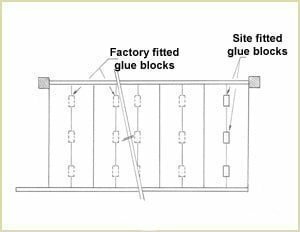 Use plenty of glue, and when positioning the blocks, move back and forth to remove all the air. Fit the top newel using glue and dowels. (See below). Glue and dowel top newel onto strings. Taper dowels slightly for ease of entrance. Tap snugly into place with a mallet. Cut off excess dowel and sand back. Glue and dowel the rake handrail. 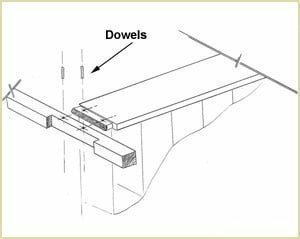 The dowel holes are drilled slightly offset to ensure the joints are pulled tightly together. Taper dowel slightly for ease of entrance. Tap dowel snugly into place with a mallet. Cut off excess dowel and sand back. Use plenty of glue. Fit the top riser and the top nosing. The top nosing may have to be cut to suit. The staircase is now ready to be put into place. 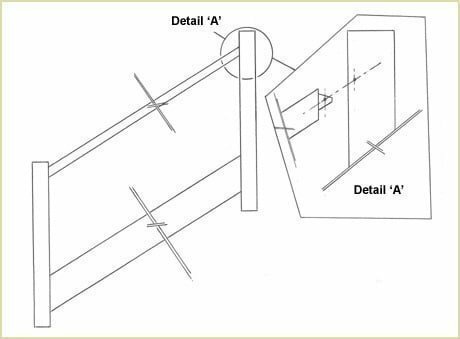 When you are sure it is in the correct position, check the stairs are level. 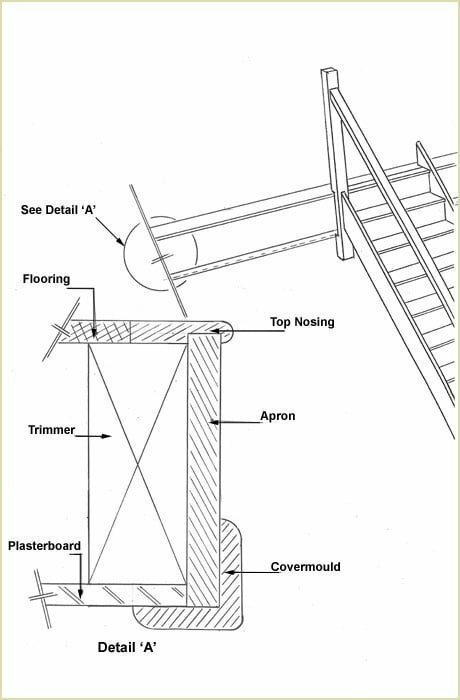 Secure stairs by fixing to wall. Place staircase into position ensuring the treads and risers are level. Use a spirit level to check this. 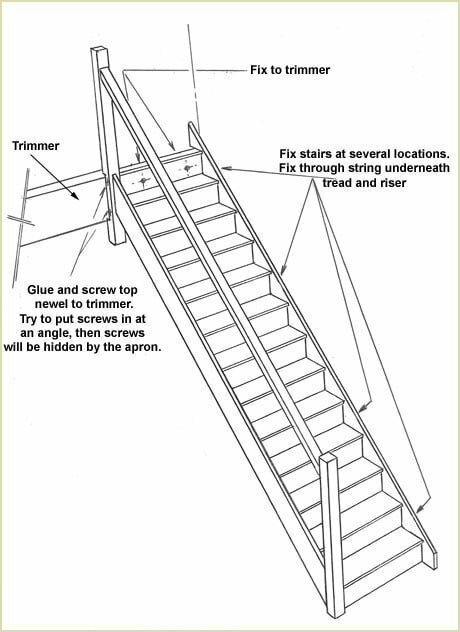 When the staircase is in the correct position fix it to the trimmer and wall as several locations. 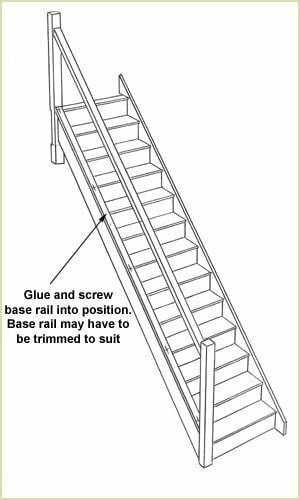 Fit base rail on the rake of stairs. Fit apron, nosing and cover mould. 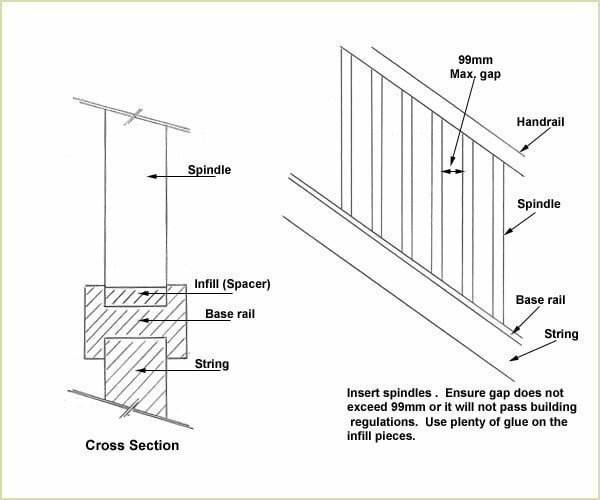 Fit spindles and infill pieces. (see below). Fit newel caps and glue them on. 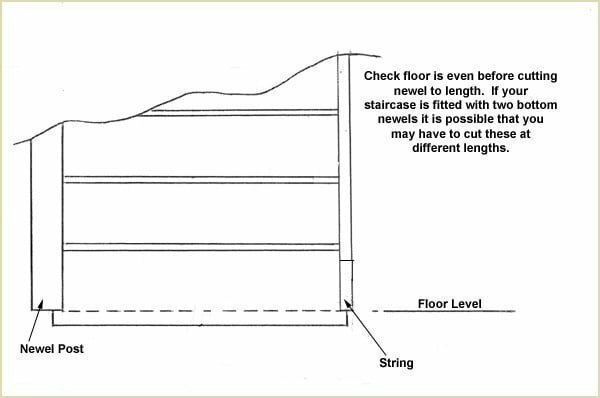 Please Note -These tips are only a guideline and fitting different styles of staircase may vary from the above. 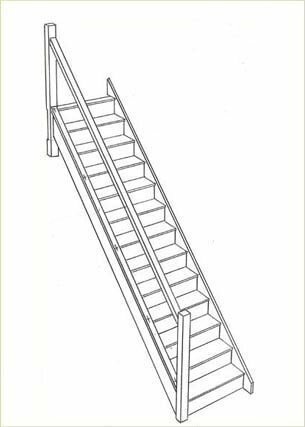 Pear Stairs sell staircases in all shapes and sizes, but remember if you have any questions don't hesitate to phone us about your staircase choice. We are a very friendly company, phone Pear Stairs on 01938 553311.